William Shakespeare is one of the greatest writers and playwrights in English literature. He is considered as the ‘father of English literature’ because of his immense contribution to the language of English. He is often called England’s national poet and the “Bard of Avon”. [Places associated with great personalities become famous as the persons themselves. As Shakespeare was a great playwright also, the globe theatre of William Shakespeare needs a special mention. The Globe Theatre situated in the Southward district eastwards as far as Porter Street and from Park Street southwards as far as the back of Gatehouse Square in London is associated with the great playwright William Shakespeare. It remained unknown until discovered in 1989. It was not only one of most famous playhouse’s of all time, but the play house where Shakespeare was able to perform many of his greatest plays. The Theatre became as famous as he was during those times. To trace the history of the globe theater, commonly and in short called ‘globe’, there were several shareholders who owned their respective shares of the globe. Shakespeare himself was one of the co-owners. Two of the six Globe shareholders, Richard Burbage and his brother Cuthbert Burbage, owned double shares of the whole, or 25% each; the other four men, Shakespeare, John Heminges, Augustine Phillips, and Thomas Pope, owned a single share, or 12.5%. As a result of these attempts, the theatre was opened in 1599. It became one of the most money-making play houses of those times contributing much to art, literature and theatrics. The theatre is said to have been built by Cuthbert Burbage, brother of the famous Shakespearean actor Robert Burbage and son of James Burbage. As regarding the capacity and structure of the theatre, had a total capacity of between 2,000 and 3,000 spectators. There was no lighting facility availability and therefore, plays were conducted during the day time. Acoustics were poor and the actors were compelled by circumstances to shout their lines, stress their enunciation, and engage in exaggerated theatrical gestures. The theatre had a stage which was a level platform about 43 feet in width some 27 or 28 feet deep that was raised about five feet off the ground. The theatre operated outside the jurisdiction of the city officials and bureaucracy although the same was condemned by the London authorities. The audience was well educated and mostly those sections of the population who enjoyed a high status in the society. The plays which were performed here were Julius Caesar, were Hamlet (1600-1601), Twelfth Night Or What You Will (1601), Richard II (February 7th 1601) Troilus and Cressida (1601-1602), All’s Well That Ends Well (circa 1602), Timon of Athens (c1604), King Lear (1605), Macbeth (1606), Pericles, Prince of Tyre (1607) possibly The Tempest in 1610, The Two Noble Kinsmen in 1611, Shakespeare’s “lost” play Cardenio in 1612 and Henry VIII in 1613. This globe theatre was destroyed by fire on 29 June 1613. A new one i.e. 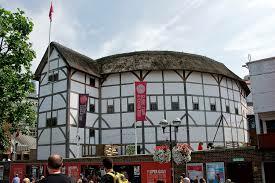 a second globe theatre was built on the same site by June 1614. But it was closed in 1642. 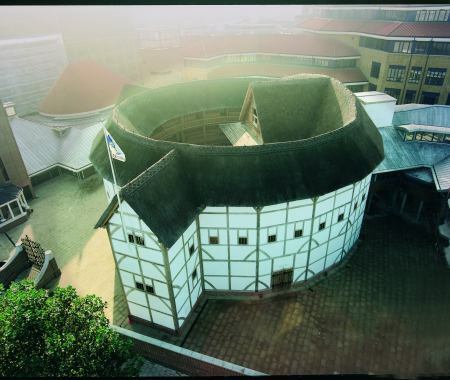 However, A modern reconstruction of the Globe, named “Shakespeare’s Globe” was opened in 1997. It is built on the London Borough of Southwark, on the south bank of the River Thames.